Disclaimer: Mulder, Krycek and Marita belong to Chris Carter, Ten-Thirteen Productions and 20th Century FOX. A wet, two laned road covered with leaves is illuminated by the reflection of non moving car headlights. Suddenly, the lights go out. Pitch blackness is interrupted by a flashlight inside the car. TEENAGE BOY~ (V.O., whiny) C'mon guys, take off the blindfold. The flashlight moves, revealing the boy's face....He is a young ALEX KRYCEK with acne. YOUNG KRYCEK~ (shocked, looking around) Guys....why are we here? BOY #1~ (laughs) 'Cause we're *trying* to catch a glimpse of Annie's ghost....*Alexi*. More teens snicker from the backseat, but only their shadows are seen in the B.G. YOUNG KRYCEK~ (trying to act tough) I knew that....Annie....ghost....Midgetville? The flashlight is snatched from YOUNG KRYCEK by an unidentified boy in the backseat. BOY #1~ (lighting cigarette) No way, man....Annie was hit by a car! Murmurs of still unseen teens are heard from the backseat. YOUNG KRYCEK~ (clearing throat loudly) Whatever....I'm not afraid. Laughter in the B.G. 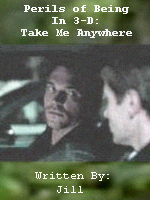 Camera takes P.O.V of the flashlight held by BOY #2 in the backseat, shining it in YOUNG KRYCEK'S face. YOUNG KRYCEK~ (trying to be tough) There are no such things as midgets *or* ghosts! BOY #1 snatches the flashlight. His hand is briefly over the camera as he grabs it, giving it to an unseen backseat passenger. Camera takes P.O.V of the backseat. He pushes YOUNG KRYCEK right out the door! Camera is on YOUNG KRYCEK in the street, shocked. BOY #2~ (V.O) Grab a midget from the woods and bring it to school tomorrow! Laughter, a slammed car door, and a car speeding away are heard as YOUNG KRYCEK pulls himself off the ground. Camera follows him as he chases the taillights, which soon disappear. In the dim light caused by a full moon, YOUNG KRYCEK'S face is seen close up, desparate and frightened, as we FADE OUT. ALEX KRYCEK'S wet face and hair area all we see in the present, as the camera moves backward in front of him, coming down the hallway from the elevator. We now see KRYCEK'S wet trench coat and hear him fumbling with his keys in the door of Apartment 42. Camera is from KRYCEK'S P.O.V as he steps inside the apartment. FOX MULDER is relaxing on the couch in his Rocky and Bullwinkle pajamas with a jar of pickles, watching Rugrats on TV. Camera takes MULDER'S P.O.V, staring at a soaked KRYCEK in his work clothes, then switches back. KRYCEK~ (irritated) Damn it, Mulder! You could at least have shown up for work today! I had no one to sit with during lunch hour. (pouts) All the other agents were making fun of me! MULDER~ (standing up, stretching with a magazine in his hand) Umm....I normally would have....but, I couldn't find a suitable babysitter for the fish....Why are you so wet? KRYCEK~ (snapping, rolling eyes) The rest of Washington knows it's *raining*! MULDER~ (smiling widely, scratching at a milk stain on his pajama shirt) Well, someone will be happy again soon....We're going on a road trip! MULDER~ (stubbornly) That never happened! You *dreamt* it....Anyway, pack your bags, 'cause this one is gonna be fun! MULDER~ (begging and childlike) Pleeeeease?!?! I'll be your servant for a week....C'mon! KRYCEK~ (smirking at the possibilities) I don't know why I'm saying this....but, sure. Take me anywhere. Camera is on MULDER as he dances around the living room. MULDER~ (elated) Woohoo!!! Extra time with my bestest buddy! Camera follows KRYCEK in the direction of his room, then focuses on his still wet work shoe, as he steps on a magazine called Weird NJ....FADE OUT. All we see is a man's hand putting a cassette in a car's cassette player. Camera takes the dashboard's P.O.V, on MULDER driving, wearing a light blue "I'm With Stupid" t-shirt, and KRYCEK talking on his cellphone in the front seat. KRYCEK~ (shouting, putting a hand over the listening part) Mulder! We're *not* listening to the Full House theme again! That was beyond torture! MULDER~ (turning to KRYCEK, smiling easily) Relax, buddy....This is even better! A teenage girl's voice bearing a New York accent is heard from the radio. MULDER~ (proudly) My personal phone psychic, Cleo, gave me one of her self-help tapes! MULDER~ (embarrassed) Well, it only cost me $25....Plus $10.50 shipping. KRYCEK~ (into the phone) Sorry about that, Marita....You know how Mulder is. KRYCEK~ (holding his hand over the phone again) I still can't believe we had to take a ferry to get to....wherever the hell we're supposed to be. I almost got *boatsick*! MULDER~ (smirking) It's called *seasickness prevention tablets*, my nauseous friend. After we see KRYCEK mouthing off an insult to MULDER, camera changes to KRYCEK'S P.O.V, looking out the car window at trees, grass, highway, then finally a large green sign which reads "WELCOME TO NEW JERSEY....THE GARDEN STATE." Camera focuses immediately on a horrified KRYCEK. KRYCEK~ (hollering, frightened) New Jersey?! What the fudge are we doing in this bad, bad....stupid place?! MULDER~ (calmly) What's wrong with New Jersey? It ranks 14th in the country for the state with the most UFO sightings. KRYCEK~ (still freaking out, hanging up on MARITA) Is that why we're here, Foxy?! MULDER~ (speaking in an unusually soothing voice) Nooo....we're on a Weird NJ road trip! I wanna see the fabled places they tell about in the magazine! The giant shell pile, searching for Captain Kitt's buried treasure....and, of course visit Riverview Drive....aka Annie's Road! KRYCEK~ (insane with shock and rage) What the hell is wrong with you?! Don't you get it?! That place is cursed! That place is dark! Take me home....*right now*! KRYCEK~ (pulling out his gun, pointing it at MULDER'S head) Yes, we *are*! MULDER~ (quickly getting angrier, aiming his gun at KRYCEK) No, we're *not*! Their car slows to a stop at a traffic light. Camera takes the P.O.V of the light. We see MULDER and KRYCEK'S rental car....to the left is a police car. Camera moves to the dashboard inside the police car. COP #1 rolls down his driver's side car window, motioning to MULDER or KRYCEK to roll their window down. Camera shows the traffic light turning green, then the back of MULDER and KRYCEK'S gold Chrysler Seabring as they speed away....and we FADE OUT.